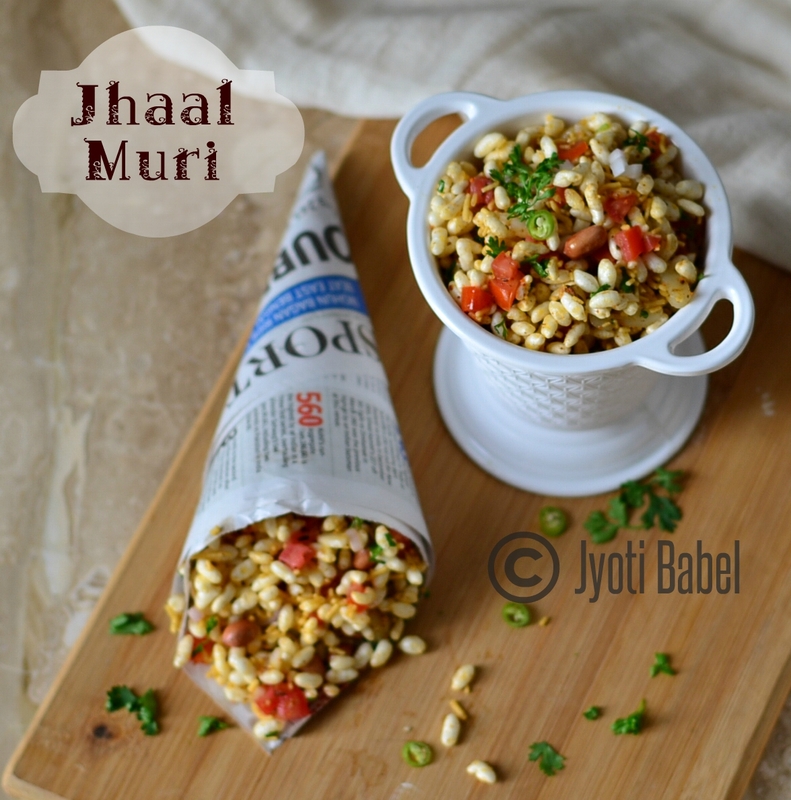 Jhaal Muri is another popular street food from the state of Bengal. It is a light snack and is quite healthy too. ‘Jhaal’ in Bengali means ‘spicy’ and ‘muri is puffed rice – and it translates to spicy puffed rice. In the streets of Kolkata, the street vendors prepare them instantly and serve them in newspaper cones. With chopped onion, tomato, boiled potatoes, peanuts, sev bhujia, mustard oil and a blend of spices, it is a delightful snack to munch on. Using mustard oil is a must, as it imparts the dish its characteristic taste. While it might look somewhat similar to Bhel Puri, it’s taste is altogether different. In all the years I have lived in Pune, I have realized that Pune doesn’t have a true winter. Here we have slightly chilly mornings and evenings, but the afternoons are pretty hot. Compared to the winters I have seen growing up in Assam and Rajasthan, winters here are actually nothing. However, the weather in Pune today is cold and chilly, thanks to the cyclone Ockhi which is influencing the weather in the south and west of India to a large extent, and will continue to do the same for a couple of more days. So, today it made perfect sense to indulge in an afternoon cup of tea and I enjoyed it with a paper cone full of jhaal muri. Let's learn how to make jhaal muri from scratch now. 1. 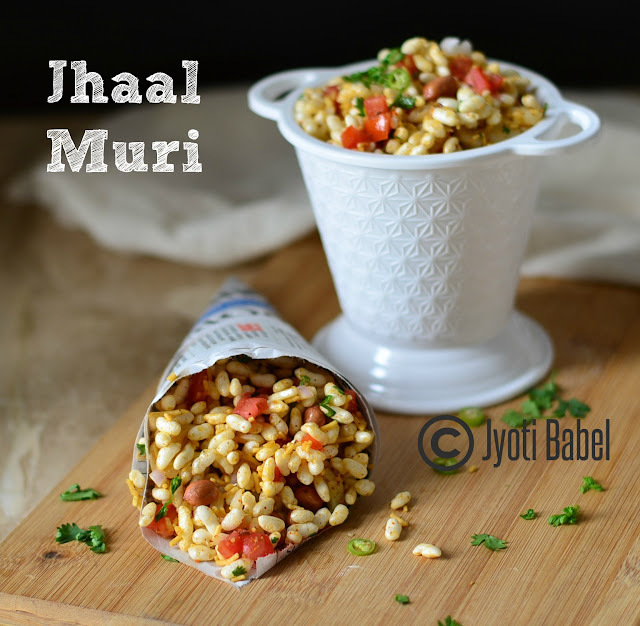 Mix all the ingredients listed in the jhaal muri masala and store in an airtight container. Use as needed. 2. Add mustard oil and prepared jhaal muri masala in a large bowl. Add puffed rice, chopped onion, tomato, potato, green chillies, peanuts, coriander leaves, bhujia sev, and toss to mix well. Check the seasoning and adjust as needed. 3. Right before serving add a dash of lemon juice and toss again to mix well. Serve immediately with a cup of tea. 1. This snack must be made right before serving, else the puffed rice will become soggy. If making for a get-together you can do the prep work beforehand and mix it when you are ready to serve. This post is a part of the Blogging Marathon under the theme 'Make Street Food at Home'. A mouth watering recipe. It sure will perk up the gloom cast by cyclone, here in Mumbai, too! Very tempting pic. Wish I could reach out and help myself to some. And this jhaal muri rocks, never get bored of this fantastic streetfood, all time favourite. Beautiful and mouth watering presentation. The cyclone had its effect here too , got pretty windy and chilly and perfect time to indulge into this spicy jhal muri . I love it when it is spicy ..
Wow, a simple and easy snack. I love it. I loved jhal muri when I made it a few years back. Looks delicious. So delicious... my mouth is watering just reading your post! I am going to try it soon.